We have collected and analyzed 2 expert reviews and 25 user reviews from international sources. Experts rate this product 60/100 and users rate it 71/100. The average review date is Jan 6, 2010. We have compared these reviews to 367686 reviews from other Camcorders. The alaScore™ for this product is 77/100 = Good. 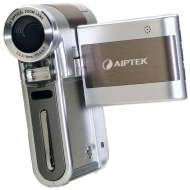 Last update: Apr 19, 2019.
alaTest has collected and analyzed 13 user reviews of Aiptek Action HD from Amazon.co.uk. The average user rating for this product is 4.0/5, compared to an average user rating of 4.0/5 for other Camcorders on Amazon.co.uk. Reviewers really like the usability and price, but some have doubts about the image quality and durability. Easy on the wallet and small enough to slip in your shirt pocket - so what's the catch?